Emu Park, a coastal town, is 30 km north-east of Rockhampton and 15 km south of Yeppoon. The place was noticed by three Rockhampton residents while on a fishing trip in the mid-1860s, and recommended itself as a beach spot where Rockhampton inhabitants could escape the inland heat. Despite a local leaseholder, Robert Ross, resisting moves by Rockhampton locals, a village reserve and seaside watering place were gazetted in 1869. 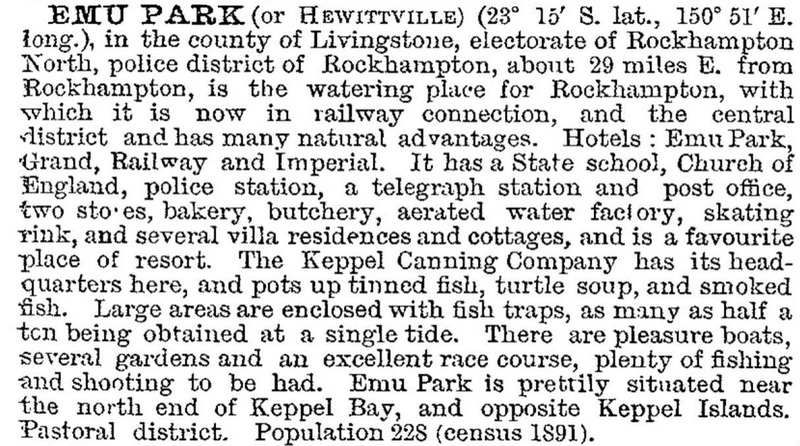 Emu Park's role as Rockhampton's favourite watering place was overshadowed by Yeppoon soon after the railway line to Yeppoon was opened in 1909. Even so, as the Catholic Church had done in Yeppoon with two schools, a convent primary school was opened in Emu Park in 1917. By the 1930s motorised private transport was overtaking rail travel, and a coast road joining Emu Park and Yeppoon was opened in 1939. The road probably benefited Yeppoon more, as Emu Park's population continued to decline until the 1960s when it rose and approached the level reached in 1920. A surf lifesaving club was opened in 1956, 30 years after Yeppoon's. After years of holding on, the Convent school closed in 1965, a year after the railway line was closed. Content and easy-going, Emu Park moved forward with the laying on of a reticulated water supply, after much debate, in 1967. Perhaps it was glad to be thus, as it was spared the controversy over the Iwasaki resort development in Yeppoon in the 1970s. Emu Park, reflecting on its past, formed a history society and opened a museum in 1984 in a building that had been the Mount Chalmers police station and the Yeppoon court house. It also constructed a 'singing ship' memorial in 1970 to commemorate Captain Cook's voyage: concealed pipes in the sails and rigging emit a sound in the breeze. From 1970 until 2000 Emu Park's population nearly doubled to 2700. In addition to the facilities already mentioned Emu Park has golf and bowling venues, a hotel-motel, local shops and a primary school. Its main beach is backed by Bell Park. Originally gazetted as a botanic garden in the 1890s, Bell Park has been a traditional venue for picnics and social gatherings. It is listed on the Queensland heritage register. Immediately to the south of Emu Park there is a residential area named Zilzie. The Seaspray residential development at Cocoanut Point, Zilzie, was approved in 2003, with 64 hectares of wetlands and forest set aside for protection in the Capricorn Coast National Park. The Emu Park Village shopping centre with a supermarket and six specialty shops (2011) and a sewerage treatment plant (2011) served both communities.